Analyzing the Dribbling Patterns of Some of the NBA’s Best Shooters (or, What Makes Steph So Great) | My Three Senths: Sports. Business. Life. It’s cliché at this point to state that the NBA has become a shooter’s league. Guys who can knock in shots reliably from behind the arc are at a premium and sought after more than ever. Just look at what the Cavaliers have done in the playoffs so far. However, even as the amount of skilled shooters (and more generically, scorers) increases, some players – looking at you Steph – continue to set themselves apart from the pack. There are a lot of good scorers, good shooters, but what separates good from great is the versatility of their shot making ability. To be able to put the ball through the net in any condition. 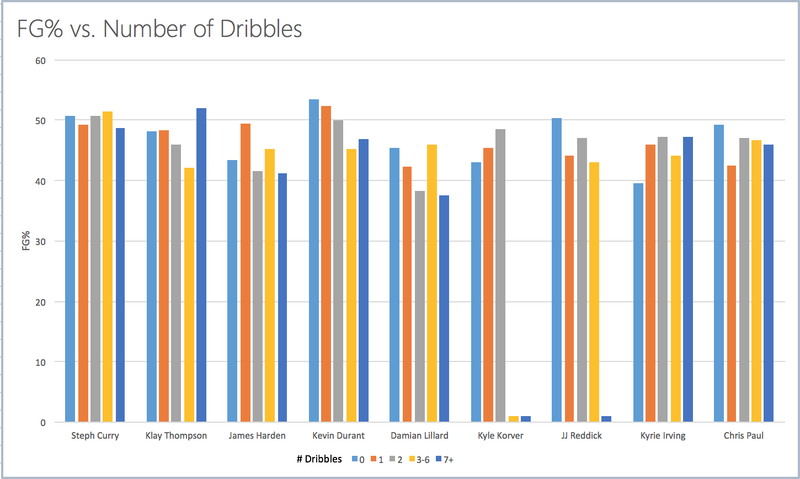 One of the ways we can analyze this versatility is via a ball handling pattern leading up to a shot: number of dribbles used. 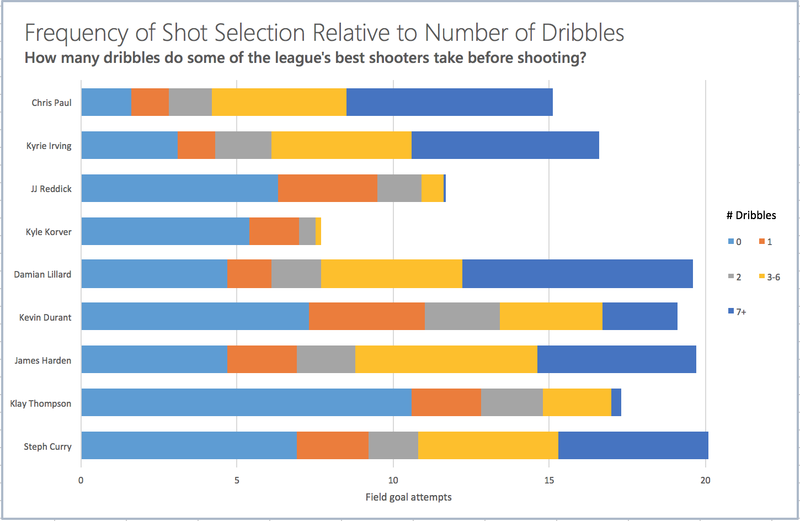 Number of dribbles allows us to see how much a player moves with the ball before shooting, how often they put the ball on the floor. We can get a nuanced look at players’ shot selection. How good are they with catch and shoot plays (which can be characterized by no more than 1 dribble)? How well do they shoot if required to isolate themselves for a while? How good are they at creating their own shot? The NBA Stats treasure trove online thankfully provides us this repository of data. So I looked at these patterns for 9 players who are widely considered among the best and most accurate shooters in the league: Chris Paul, JJ Reddick, Steph Curry, Klay Thompson, Kyrie Irving, Kevin Durant, James Harden, Damian Lillard, and Kyle Korver. But then, to separate drives and layups from jump shots, we can go still deeper and look at 3FG%. This is where the magic of Steph bears out. Although guys like Reddick can match or perform better on spot up shooting (48.3% for both on no dribbles and 49.3% for JJ vs 43.4% for Steph on 1 dribble), Curry is the only player who still makes more than 40% of his 3 point shots after 3 or more dribbles. That’s inane. He can just isolate himself behind the arc, hang around for a little bit, then flush a triple down in a defender’s face. He has a better 3FG% after toying around for 7+ dribbles than most good shooters have spotting up. 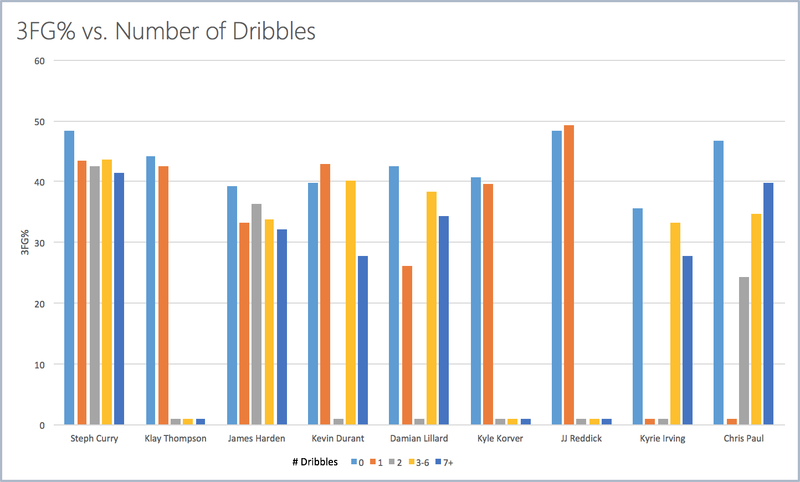 Not even the great Kevin Durant can dribble around for that long and still be accurate (only 27% on 7+ dribbles). The only player who comes close to Curry’s excellence is Chris Paul (39.8%), an incredibly efficient shooter albeit one who just doesn’t look for his shot as often as others on the list. This is exactly why so many fans clamor for players to not simply isolate themselves as the shot clock winds down or on the possession at the end of a quarter. When James Harden rears back ready to dribble out the clock, more often than not, the shot won’t go through. This is why Iso-Joe was such a harsh criticism of Joe Johnson. It takes a truly transcendent shooter, someone like the Point God or the Greatest-Shooter-in-NBA-History-and-Back-to-Back-MVP, to be effective on a heavy isolation play. And even then, we’ve never seen someone like Steph who combines the high volume of heavy dribbling with accurate shooting. It’s generally taught that pull up shots are much harder than spot up shots. However, Curry makes pull up shooting look academic. Unlike other players, he can find and create his own shot from distance. He has taken the nuances of a very specific skill (shooting) and so thoroughly mastered those nuances that his dominance has become comical. That’s what separates good from great, and great from historic.